My Boat is patterned after the boat I saw in the Ogeechee river as a kid, these boats were built by various builder in south Georgia half a century ago, they were unique in their design and performance, built back before outboard motors were common these boat were built to paddle in the small rivers and creeks, the stern is the small end, the paddler could easily paddle these boats up stream in most small rivers, the boats paddles and perform similar to a kayak or pi rogue but has the stability of a john boat, the design is fast and in my opinion the best small paddle fishing boat I have ever seen. I built this one from my and my dad’s memory, a few old pictures and a few of the old boat that still around. 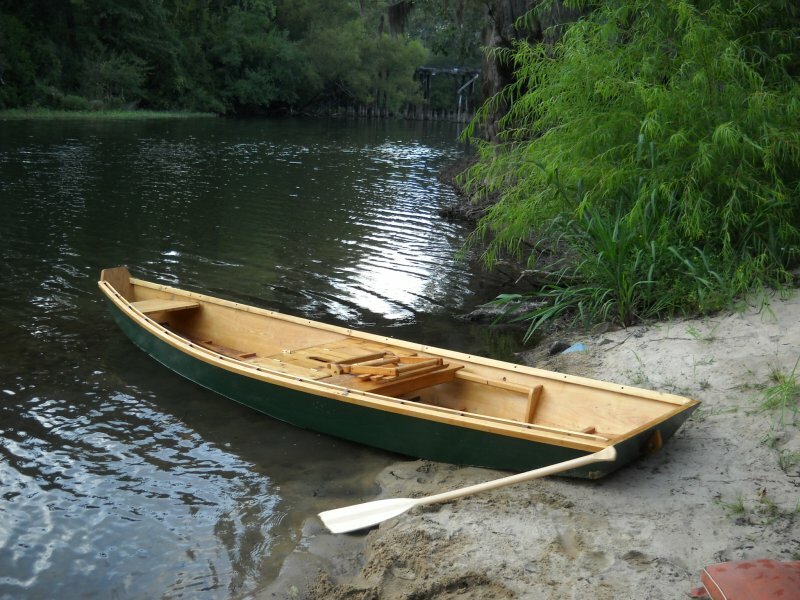 the boat were built in various configuration, I built this one with the adjustable front seat that allows the user to slide the front seat back or forth to adjust for the load of the boat, the narrow stern is true to the orginal. The boat is built out of cypress, cedar, heart pine, fir, spruce and a little oak from a Jack Daniels whiskey barrel, then coated with epoxy resin and finished with a spar varnish.